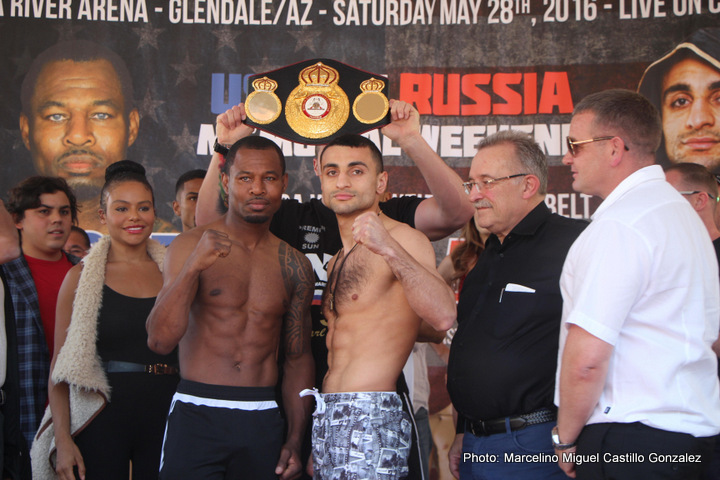 #3 WBA “Sugar” Shane Mosley (49-10-1, 41 KOs) saw his dreams of a big fight wash away before his eyes tonight with him losing a 12 round unanimous decision to interim WBA welterweight champion David Avanesyan (22-1-1, 11 KOs) at the Gila River Arena in Glendale, Arizona. The fight was a competitive one from start to finish. The telling factor in the contest was the two or three head-snapping shots the 27-year-old Avanesyan landed in each round. Mosley wasn’t landing with enough regularity to get the victory. The judges’ scores were 114-113, 117-110 and 117-110. The 117-110 scores seemed a tad bit wide to me. I thought the fight should have been scored a little closer. I thought Avanesyan won the fight by a couple of rounds at best. He was not looking impressive at any time. He just looked like a fighter with a paper title rather than a real champion. Mosley, 44, lost a point in the 10th round from a low blow. That messed things up for Mosley because he appeared to be fighting better at that point and staging a comeback of sorts. Mosley still fought well in the 10th and 12th rounds. Avanesyan was clearly very tired at the end of the fight and not looking very solid. Fortunately for him, he had built up a big lead from the earlier rounds and was able to win a fairly comfortable decision. Avanesyan landed a hard left to Mosely’s midsection in the 11th round that appeared to hurt him. Mosley seemed to be guarding the right side of his midsection. He might have been injured in the fight or it could have been something he came into the fight with. Either way, Mosley didn’t like getting hit on that side of his body. Avanesyan will now be fighting the Keith Thurman vs. Shawn Porter winner. Off of tonight’s performance, I see Avanesyan losing to either of those guys. I think Avanesyan will be out of his class when he faces the winner of that fight, and I suspect it’ll be a horrible mismatch and not a good fight for the sport. Super middleweight Shane Mosley Jr. (7-1, 5 KOs) gritted out a close six round majority decision over Roberto Yong (5-8, 4 KOs). I came away more impressed with Yong than I did Mosley Jr. The final scores were 57-57, 59-55, 58-56. Mosley Jr. was getting nailed repeatedly by huge blasts from Yong in rounds one through three. Yong showed world class power in those rounds. What he lacked was stamina, defense and a good jab. The only reason Mosley Jr. won the fight is because Yong got tired after the third round. It was good match-making to put Mosley Jr. in with a fighter that was capable of fighting hard for only three rounds before tiring out.